Log home designs appeared in North America in the early 1700s. Being a popular design, by the 1920s, the first milled log houses appeared using logs that were precut and shaped. Log style homes are timeless and instantly will transport you back to a time when life was simpler. Although log homes may seem like a primitive style, the log construction of today is anything but old-fashioned. These amazing homes are filled with modern architecture and up-to-date conveniences. House Plans and More features beautiful Log house plans, with rustic exteriors and floor plans to help you live a simple, comfortable and serenel lifestyle. With a big variety of rustic log plans, you'll be able to find the home you've laways dreamed of. 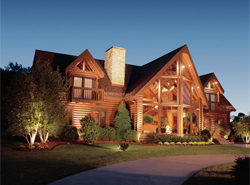 Discover House Plans and More and shop our selection of Log home floor plans and Log Cabins.